I haven’t waited in line for a movie for quite some time, little less one playing at your local cineplex. The Hunger Games changed all that this weekend. I found myself standing in line with packs of teenage girls (each five or six strong), along with a healthy smattering of adults and young boys — in short, a mélange of humanity that was interested in what will likely become the phenomena of The Hunger Games. The film just filed an opening weekend of $150 million plus – the largest film opening of all time for a non-sequel – 3rd largest for all films in all history – a ‘shocker’ according to imdb. And it has just got started. Well, you ask, was it a good film? Let me say this. As a cultural artifact it was one of the most powerful works I’ve seen since the post-Vietnam era, where the likes of Francis Coppola and Apocalypse Now were also lining them up outside the theater. In those days, a serious, topical drama could actually get a place at the mainstream distribution table in the United States and not be crowded out by numerous Vampire knock-offs, low-brow comedies, and ads for the Marine Corps. My favorite one of late is the upcoming Abe Lincoln: Vampire Hunter. I can imagine studio heads laughing themselves into hysterics how their foisting that one on their teenage audience. And we thought Soviet Russia was creative at re-inventing history. But back to Hunger Games. Well, you might ask, was the film as artistically satisfying as Apocalypse Now or other ‘important’ films? Not exactly. 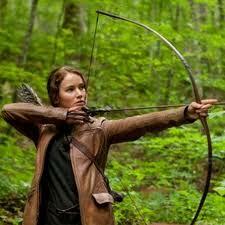 As a sci-fi film, I would rank Hunger Games on the artistic level of Star Wars and any good James Cameron movie. Some might even question whether Gary Ross was the best choice to direct; after some reflection, my take is that Ross may have indeed been a very good choice, for reasons I’ll get into later. That said, the execution of the film was at times lackluster, particularly in the Wizard of Oz-like scenes at ‘The Capitol,’ where protagonist Katniss Everdeen (played brilliantly by Jennifer Lawrence) and Peeta (competently portrayed by Josh Hutcherson ) get their training and makeovers in prep for the Games. Thematically, there’s a lot going on in The Hunger Games, and this is its real strength. The ideas of the film are powerful, multi-tiered and on the level of great satire. Not the funny kind of satire that we think of when we hear the term today, but the satire of Jonathan Swift and Gulliver’s Travels, which during its time was a great social commentary on human nature and the mechanics and folly of Empire. So much of the strength of Hunger Games must go back to the source material, and the author Suzanne Collins, who stated that she got the idea for the books after channel surfing and finding an eerie similarity between the Iraq War coverage and reality TV shows. As for the books, I have to admit I have not read them, so cannot make a comparison to the film or comment on their literary merit. But again, as for the ideas of the film, and the way the themes were carefully and skillfully weaved together, this in itself is quite an accomplishment. On one level Hunger Games is certainly an anti-war film, and gets into the mechanics of how wars are bought, sold and packaged to a manipulated populace. But because there is no real ‘enemy’ to fight in Hunger Games, but rather the Game is depicted as a ‘punishment’ for ‘past sins’ of the rebellion, we venture into some pretty interesting thematic territory over and above your standard anti-war message. In this sense the film transcends themes of war and dissects how elites control their subjects in modern societies. As such, Panem’s ‘Capitol’ (the Capital city of the futuristic dystopia of Panem) serves as a proxy for the Pentagon, the Vatican, the US Capitol, Las Vegas, New York, London and Shanghai all rolled into one. The idea of the war ‘game’ (which the film is modeled after – i.e., a military war game or a reality game show) serves a multi-leveled social device, some stated but most of it unstated and hidden. The stated part is that wars bring unity; the unstated part is that older generations manipulate, coerce and/or draft the young into an effort that they may or may not want to play a part in and certainly have no responsibility in creating. The social drama is played out and serves as a mechanisms for social cohesion for the top 1%, who view war as a spectacle or method of ‘penance’ (debt with interest?) of the ‘bad’ or ‘flawed’ or ‘weak’ people who must depend on them (when in reality the reverse is the case), and coercion to the 99%, who see war as a way to ‘serve with pride’ and/or ‘win the prize’ in the case of economic warfare, gambling and/or winning the lotto. The 99% are also, importantly, motivated by fear and under the boot of an oppressive police state who fascinates them with their power and prestige: hence the word fascism as it arises from fascination with power. To go a little further with ‘one percent’ theme, in the case of the neo-feudal Panem, the ‘Capitol’ could just as aptly be named the ‘Capital’ in that it is the requirements of Capitalism that keep it humming and give it purpose. It is a city of aristocrats, costumed appropriately, and all under the gilded elegance of a techno-fascistic state. The dangers of technology and the media manipulation to fuel a story is not new (you can think of The Truman Show) but the way The Hunger Games fits so well into the current social moment, with Occupy Wall Street (and others) again about to hit the streets in protest, makes the film’s context as powerful as its storytelling. That repeated motto of the Games ‘may the odds be in your favor’ is of course a pun on ‘may the Gods be in your favor,’ and alludes to a Las Vegas motif, but also to that of the casino capitalism that we’ve all bought into hook line and sinker. Now this is where I’ll veer from the normal purview of the film critic, most of whom will not venture into this thematic territory, or have not pondered it very deeply. For outside of the anti-war and social control elements also mentioned, the film is also a critique on how economics plays so neatly into our media and war spectacles, much the same way they did during the Coliseum of the Roman Empire (with characters aptly named Caeser Flickerman and Seneca Crane). The casino mentality showcased in The Hunger Games contrasts itself to other means of social organization that are effectively labeled as ‘socialistic’ by many in this country. I often find it amazing how we accept the organization of mega-corporations, give them personhood status, allow them to donate millions to political campaigns, and yet in general call any attempt of working people to unite (or gain common benefit) ‘socialistic.’ I’m sure there will be a commentator or two that will say that Hunger Games has a socialist tinge to it (although others will argue just as strongly the film promotes an Ayn Rand type of rugged individualism). Regardless, the film’s power is that it displays the potential for a neo-feudal corporate world where the corporate interests of the top 1% are so intertwined with the political elites that they become indistinguishable. Many would argue in fact that we are already there, and Hunger Games is really not just about where we are headed, but rather a first class satire on our current situation, which in many ways is just as de-humanizing as what is depicted in The Hunger Games. Another important theme in the film is that of ‘wounds.’ For while the film is fairly bloodless and restrained in its depiction of violence, it is quite visual in depicting its results. This may be why Gary Ross was selected as the film’s director, for he is much more of a ‘soft’ portrayer of human realities and emotions than an action film director (Ross’ past credits include Big, Lassie and Seabiscuit). While I personally ponder how Hunger Games might have been a masterpiece with a John Boorman (Deliverance) at the helm, nonetheless the harder edge that Boorman would have given it might have detracted from a certain audience. This emphasis on wounds and the healing of wounds is both a very feminine and human perspective that shows the consequences of violence in counter-balance to any glorification. I find it ironic that a film such as The Passion of the Christ was much more bloody than Hunger Games, and yet I’m sure that some ‘family friendly’ reviewers of Hunger Games might whole-heartedly endorse their children see The Passion with its much higher level of blood-letting. Not to berate religious reviewers or The Passion (which I believe had a lot of merit) but when you hear criticisms of how Hunger Games is too ‘humanistic’ and that this is a negative connotation, a reviewer such as myself takes note. I would only ask that the broad range of viewers reflect on what the term humanism actually means. For I believe that the concept of humanism must evolve to be much more inclusive than we’ve seen in the past; for example, I would call Ben Hur a humanistic film even though it explores many Christian themes, while at the same time labeling more ‘secular’ films such Norma Rae and Thelma and Louise as equally humanistic. (A much-needed re-definition of media humanism can be found here). As for Hunger Games, have other films treaded similar territory before? Certainly. In the realm of science fiction we’ve seen The Running Man, Roller Ball, Death Race 2000, and (as mentioned) The Truman Show, to name a few. But because our current social reality is mapping ever closer to what is depicted in The Hunger Games, and the efforts of mainstream media are generally focused on keeping people in a cynical and profitable place, that this film (coming notably from a Canadian company, Lionsgate), compounded with the context of the times, becomes ever more powerful because of these elements outside the screen. And it is those elements outside the theater where the real Hunger Games are being played out. The question is will we do something about inequality? Will social media serve as our own kind of ‘mocking jay’ (Katniss’ emblem and practical means of communicating in the forest) where we use organic forms of communication to outwit the 1% and convince them that we can forge something better? Do films matter enough, or really, do we matter enough, to want to change the fabric of the system to something more equitable? The Powers That Be hope that Hunger Games can serve as a release valve for festering social anger and that people really do feel ultimately powerless to change the system. Others, such as myself, believe that films like Hunger Games, and perhaps others to come (Ron Howard will apparently produce a new version of 1984) can serve to inspire our young people — indeed all of us — to shape a better world.